Automation is accelerating to a point where it will soon threaten our social fabric and way of life. We must find new ways to organize ourselves independent of the values that the marketplace assigns to each and every one of us. I am writing from inside the tech bubble to let you know that we are coming for your jobs. I recently met a pair of old friends for drinks in Manhattan. One is an executive who works at a software company in New York. They replace call center workers with artificial intelligence software. I asked her whether she believed her work would result in job losses. She responded matter-of-factly, “We are getting better and better at things that will make large numbers of workers extraneous. And we will succeed. There needs to be a dramatic reskilling of the workforce, but that’s not going to be practical for a lot of people. It’s impossible to avoid a lost generation of workers.” Her confidence in this assessment was total. The conversation then quickly shifted to more pleasant topics. I later met with a friend who’s a Boston-based venture capitalist. He told me he felt “a little uneasy” about investing in software and robotics companies that, if successful, would eliminate large numbers of jobs. “But they’re good opportunities,” he noted, estimating that 70 percent of the startups he’s seeing will contribute to job losses in other parts of the economy. Normal people. Seventy percent of Americans consider themselves part of the middle class. Chances are, you do, too. Right now some of the smartest people in the country are trying to figure out how to replace you with an overseas worker, a cheaper version of you or, increasingly, a widget, software program or robot. There’s no malice in it. The market rewards business leaders for making things more efficient. Efficiency doesn’t love normal people. It loves getting things done in the most cost-effective way possible. A wave of automation and job loss is no longer a dystopian vision of the future -- it’s well underway. The numbers have been telling a story for a while now that we have been ignoring. More and more people of prime working age have been dropping out of the workforce. There’s a growing mass of the permanently displaced. Automation is accelerating to a point where it will soon threaten our social fabric and way of life. Experts and researchers project an unprecedented wave of job destruction coming with the development of artificial intelligence, robotics, software and automation. The Obama White House published a report in December 2016 that predicted 83 percent of jobs where people make less than $20 per hour will be subject to automation or replacement. Between 2.2 and 3.1 million car, bus and truck driving jobs in the U.S. will be eliminated by the advent of self-driving vehicles. Read that last sentence again: The government is confident that between 2 and 3 million Americans who drive vehicles for a living will lose their jobs in the next 10 to 15 years. Driving a truck is the most common occupation in 29 states. Self-driving vehicles are one of the most obvious job-destroying technologies, but there are similar innovations ahead that will displace cashiers, fast-food workers, customer service representatives, administrative assistants and even well-paid white-collar jobs like wealth managers, lawyers and insurance agents, all within the span of a few short years. Suddenly out of work, millions will struggle to find a new job, particularly those at the lower end of the skill ladder. Automation has already eliminated about 4 million manufacturing jobs in the U.S. since 2000. Instead of finding new jobs, a lot of those people left the workforce and didn’t come back. The U.S. labor force participation rate is now at only 62.9 percent, a rate below that of nearly all other industrialized economies and about the same as that of El Salvador and the Ukraine. Some of this is driven by an aging population, which presents its own set of problems, but much of it is driven by automation and a lower demand for labor. Each 1 percent decline in the labor participation rate equates to approximately 2.5 million Americans dropping out. The number of working-age Americans who aren’t in the workforce has surged to a record 95 million. Ten years into the nation’s recovery from the financial crisis and 95 million working-age Americans not in the workforce -- I’ve taken to calling this phenomenon The Great Displacement. The lack of mobility and growth has created a breeding ground for political hostility and social ills. High rates of unemployment and underemployment are linked to an array of social problems, including substance abuse, domestic violence, child abuse and depression. Today 40 percent of American children are born outside of married households, due in large part to the crumbling marriage rate among working-class adults, and overdoses and suicides have overtaken auto accidents as leading causes of death. More than half of American households already rely on the government for direct income in some form. In some parts of the U.S., 20 percent of working age adults are now on disability, with increasing numbers citing mood disorders. What Americans who cannot find jobs find instead is despair. If you care about communities and our way of life, you care about people having jobs. This is the most pressing economic and social issue of our time; our economy is evolving in ways that will make it more and more difficult for people with lower levels of education to find jobs and support themselves. Soon, these difficulties will afflict the white-collar world. It’s a boiling pot getting hotter one degree at a time. And we’re the frog. In my role as Founder of Venture for America, I spent the past six years working with hundreds of startups across the country in cities like Detroit, New Orleans, Cincinnati, Providence, Cleveland, Baltimore, Philadelphia, St. Louis, Birmingham, Columbus, Pittsburgh, San Antonio, Charlotte, Miami, Nashville, Atlanta and Denver. Some of these places were bustling industrial centers in the late 19th and 20th centuries only to find themselves faced with population loss and economic transition as the 20th century wound down. Venture for America trains young aspiring entrepreneurs to work at startups in cities like these to generate job growth. We’ve had many successes. But the kinds of jobs created tend to be very specific; every business I worked with will hire the very best people it can find -- particularly startups. When entrepreneurs start companies and expand, they generally aren’t hiring a down-on-his-or-her-luck worker in need of a break. They are hiring the strongest contributors with the right mix of qualities to help an early-stage company succeed. Most jobs in a startup essentially require a college degree. That excludes 68 percent of the population right there. And some of these companies are lifting further inefficiencies out of the system -- reducing jobs in other places even while hiring their own new workers. There’s a scene in Ben Horowitz’s book The Hard Things about Hard Things in which he depicts the CEO of a company meeting with his two lieutenants. The CEO says to one of them, “You’re going to do everything in your power to make this deal work.” Then he turns to the other and says, “Even if he does everything right, it’s probably not going to work. Your job is to fix it.” That’s where we’re at with the American economy. Unprecedented advances are accelerating in real time and wreaking havoc on lives and communities around the country, particularly on those least able to adapt and adjust. We must do all we can to reduce the worst effects of the Great Displacement -- it should be the driving priority of corporations, government and non-profits for the foreseeable future. We should invest in education, job training and placement, apprenticeships, relocation, entrepreneurship and tax incentives -- anything to help make hiring and retaining workers appealing. And then we should acknowledge that, for millions of people, it’s not going to work. In the U.S. we want to believe that the market will resolve most situations. In this case, the market will not solve the problem -- quite the opposite. The market is driven to reduce costs. It will look to find the cheapest way to perform tasks. The market doesn’t want to provide for unemployed truck drivers or cashiers. Uber is going to get rid of its drivers as soon as it can. Its job isn’t to hire lots of people -- its job is to move customers around as efficiently as possible. The market will continue to throw millions of people out of the labor force as automation and technology improve. In order for society to continue to function and thrive when tens of millions of Americans don’t have jobs, we will need to rethink the relationship between work and being able to pay for basic needs. And then, we will have to determine ways to convey the psychic and social benefits of work in other ways. There is really only one entity -- the federal government -- that can realistically reformat society in ways that will prevent large swaths of the country from becoming jobless zones of derelict buildings and broken people. Non-profits will be at the frontlines of fighting the decline, but most of their activities will be like Band-Aids on top of an infected wound. State governments are generally hamstrung with balanced budget requirements and limited resources. Even if they don’t talk about it in public, many technologists themselves fear a backlash. My friends in Silicon Valley want to be positive, but many are buying bunkers and escape hatches just in case. One reason that solutions are daunting to even my most optimistic friends is that, while their part of the American economy is flourishing, little effort is being made to distribute the gains from automation and reverse the decline in opportunities. To do so would require an active, stable, invigorated unified federal government willing to make large bets. This, unfortunately, is not what we have. We have an indebted state rife with infighting, dysfunction and outdated ideas and bureaucracies from bygone eras, along with a populace that cannot agree on basic facts like vote totals or climate change. Our politicians offer half-hearted solutions that will at best nibble at the edges of the problem. The budget for Research and Development in the Department of Labor is only $4 million. We have a 1960s-era government that has few solutions to the problems of 2018. This must change if our way of life is to continue. We need a revitalized, dynamic government to rise to the challenge posed by the largest economic transformation in the history of mankind. The above may sound like science fiction to you. But you’re reading this with a supercomputer in your pocket (or reading it on the supercomputer itself) and Donald Trump was elected president. Doctors can fix your eyes with lasers, but your local mall just closed. We are living in unprecedented times. The future without jobs will come to resemble either the cultivated benevolence of Star Trek or the desperate scramble for resources of Mad Max. Unless there is a dramatic course correction, I fear we are heading toward the latter. Our society has already been shaped by large-scale changes in the economy due to technological advances. It turns out that Americans have been dealing with the lack of meaningful opportunities by getting married less and becoming less and less functional. The fundamental message is that we are already on the edge of dystopia, with hundreds of thousands of families and communities being pushed into oblivion. Education and retraining won’t address the gaps; the goalposts are now moving and many affected workers are well past their primes. We need to establish an updated form of capitalism -- I call it Human-Centered Capitalism or Human Capitalism for short -- to amend our current version of institutional capitalism that will lead us toward ever-increasing automation accompanied by social ruin. We must make the market serve humanity rather than have humanity continue to serve the market. We must simultaneously become more dynamic and more empathetic as a society. We must change and grow faster than most think possible. When the next downturn hits, hundreds of thousands of people will wake up to do their jobs only to be told that they’re no longer needed. Their factory or retail store or office or mall or business or truck stop or agency will close. They will look for another job and, this time, they will not find one. They will try to keep up a brave face, but the days and weeks will pass and they will become more and more defeated. They will almost always blame themselves for their lot. They will say things like, “I wish I’d applied myself more in school,” or “I should have picked another job.” They’ll burn through their meager savings. Their family lives and communities will suffer. Some will turn to substance abuse or watch too much TV. Their health will slip -- the ailments they’ve been working through will seem twice as painful. Their marriages will fail. They will lose their sense of self-worth. Their physical environments will decay around them and their loved ones will become reminders of their failure. Related: Should Tipped Minimum Wage Still Exist? For every displaced worker, there will be two or three others who have their shifts and hours reduced, their benefits cut and their already precarious financial lives pushed to the brink. They will try to consider themselves lucky even as their hopes for the future dim. Meanwhile, in Manhattan and Silicon Valley and Washington D.C., my friends and I will be busier than ever fighting to stay current and climb within our own hypercompetitive environments. We will read articles with concern about the future and think about how to redirect our children to more fertile professions and livelihoods. We will retweet something and contribute here and there. We will occasionally reflect on the fates of others and shake our heads, determined to be among the winners in whatever the new economy brings. The logic of the meritocracy is leading us to ruin, because we are collectively primed to ignore the voices of the millions getting pushed into economic distress by the grinding wheels of automation and innovation. We figure they’re complaining or suffering because they’re losers. We need to break free of this logic of the marketplace before it’s too late. We must reshape and accelerate society to bring us all to higher ground. We must find new ways to organize ourselves independent of the values that the marketplace assigns to each and every one of us. As Bismarck said, “If revolution there is to be, let us rather undertake it not undergo it.” Society will change either before or after the revolution. I choose before. We are more than the numbers on our paychecks -- and we are going to have to prove it very quickly. 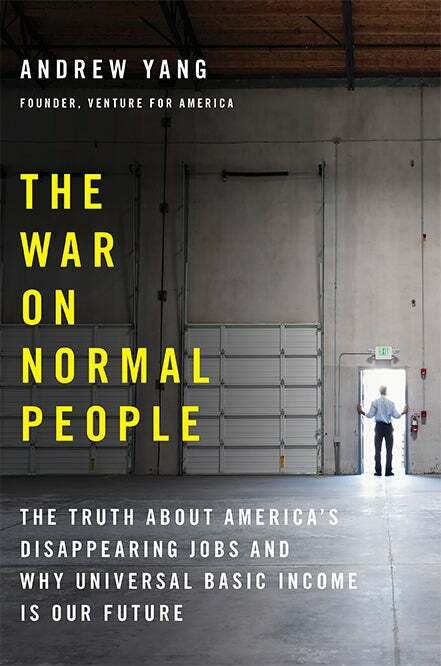 This is an excerpt from Andrew Yang's The War on Normal People, published by Hachette on April 3rd. To pre-order a copy click here.